When’s the last time you got really excited about taco salad? If so, then I suggest you give this recipe a try. How is this salad different? 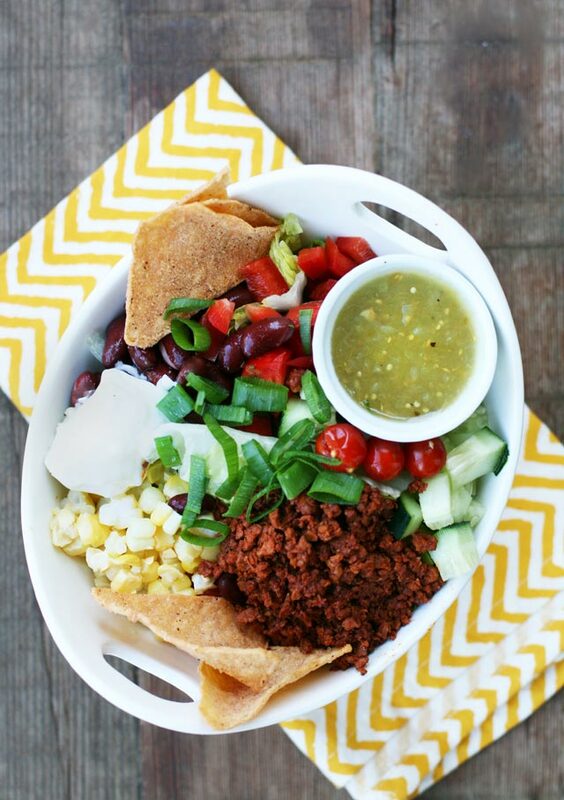 This taco salad uses Mexican-style chorizo instead of ground beef. I’ve never really cared for taco salads that use seasoned ground beef, so I decided to use chorizo instead. The chorizo gave this salad a totally different flavor. I think you’re gonna love it. Make it cheaper: Use what you have on hand. Raid your fridge, freezer, and pantry for salad ingredients. Make it vegetarian: Use Trader Joe’s Soy Chorizo instead of regular chorizo. It’s SO good – you must give it a try! Add more fiber: Trying to get more fiber in your diet? Try Beanitos chips. They’re made with beans and are really delicious – especially the flavored ones (like the sweet chili & sour cream). You can also double up on the kidney beans or add black beans to the salad. It’s totally customizable! All of the ingredients listed below combine to make a hearty, delicious taco salad. To save money, you can omit or add ingredients based on what you have on hand. Prepare chorizo according to package directions. Combine all ingredients in a large salad bowl. Otherwise, you can top romaine lettuce with each salad ingredient separately.